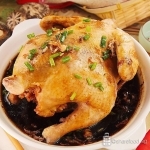 Wonderfully tender chicken with fragrant Calrose rice! Transform a whole chicken into a showstopping dish with Calrose rice, shiitake mushrooms, chestnut, herbs and simple condiments. 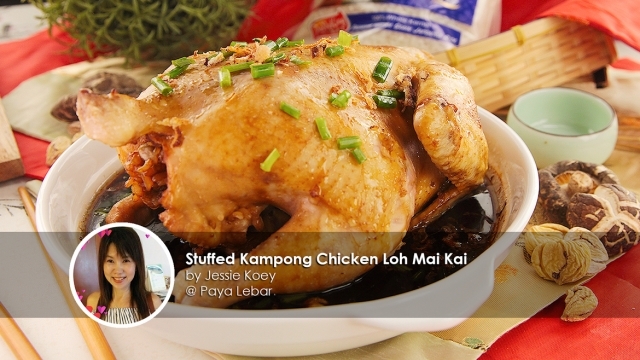 This Stuffed Kampong Chicken Loh Mai Kai recipe is shared by home cook Jessie Koey, who loves to share delicious home cook recipes on her website Jessie Koey's Kitchen. Wonderfully juicy chicken meat with fragrant Calrose rice! Loh Mai Kai (Steamed Rice with Chicken) is a Chinese cuisine that is made of a combination of rice, chicken and dry shiitake mushrooms. In this recipe, we used Paddy King Calrose Rice for the stuffing as the cooked grains are moist and have a stickier consistency as compared to long grain rice. 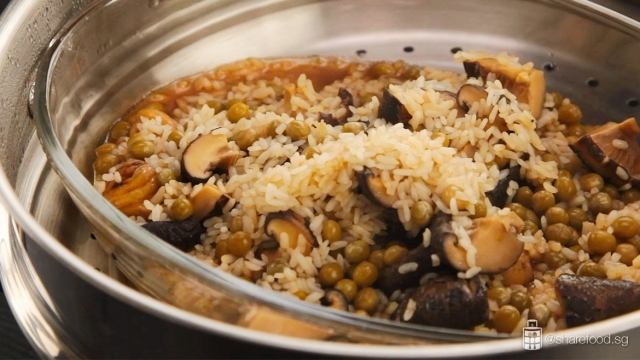 The rice gets really tasty in this cooking process as it soaks the essence of the chicken and flavours from the shiitake mushroom and other condiments. The recipe portion is slightly more than needed for the stuffing, reduce the quantity to desired or serve it on the side for the rice lovers in your family who want extra servings. Season the skin well to enhance the flavours! Do rub a good coating of seasoning over the chicken as it enhances the flavour and gives it a nice brown colour to the skin. From simple to sensational, this is one amazing dish! This is probably the best Stuffed Kampong Chicken Loh Mai Kai we've ever had. 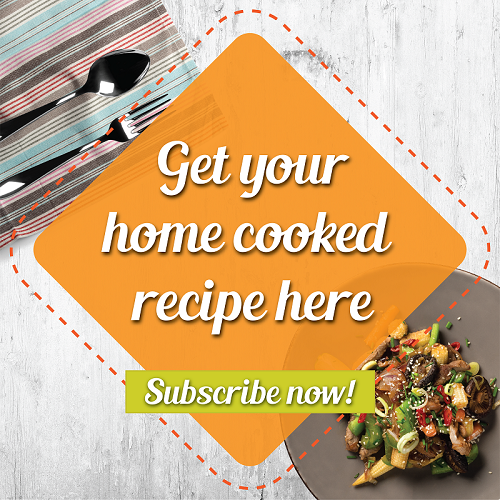 All you need is a whole chicken, Calrose rice, shiitake mushrooms, condiments and you'll have an irresistible chicken dish to serve for dinner! In a stock pot, add water till the pot is ½ filled. Boil the water. 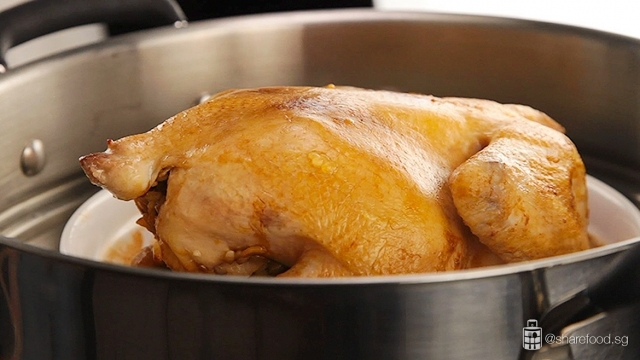 Place the chicken into boiling water and poach it for 20 – 25 minutes. Turn the chicken every 10 minutes. Remove chicken from pot and drain. Set aside. Once it has cooled down, rub 1 tbsp dark soy sauce and 1 tbsp light soy sauce inside out. Set aside. In a wok, heat the sesame oil. Sauté diced mushrooms and chestnuts till fragrant. Pour in 125 ml chicken stock, simmer over low heat for 15 minutes. Add in Calrose rice and ingredient (A), stir-fry for 3 minutes. Add in 180 ml chicken stock. Stir to combine and turn off the fire. 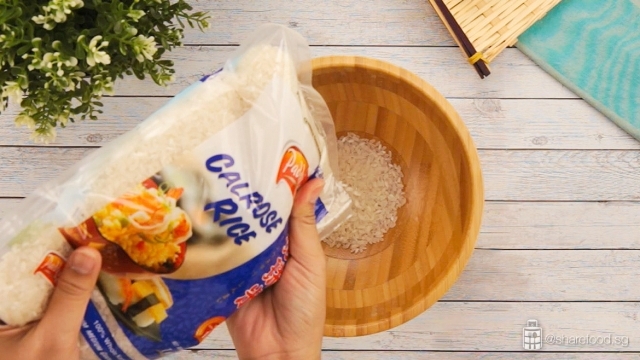 Transfer the Calrose rice into a heatproof plate. Steam for 10 minutes, till ¾ cooked. Stuff the rice into the cavity of the chicken. Return the chicken to the steamer. Steam for 15 minutes till the rice is soft and chicken is cooked through. Pour in ingredient (B) in a pan and bring it to a boil. 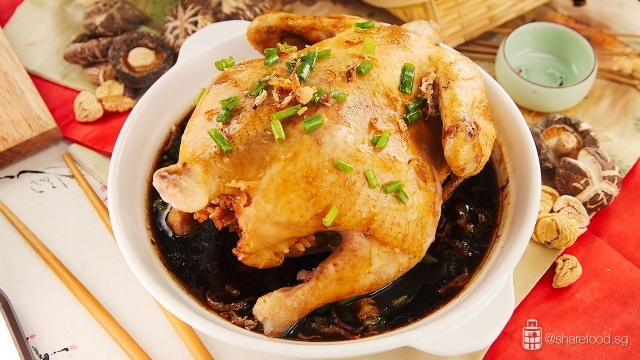 Place the chicken in a serving bowl, pour the sauce over the chicken and garnish it with crispy shallots and spring onions. 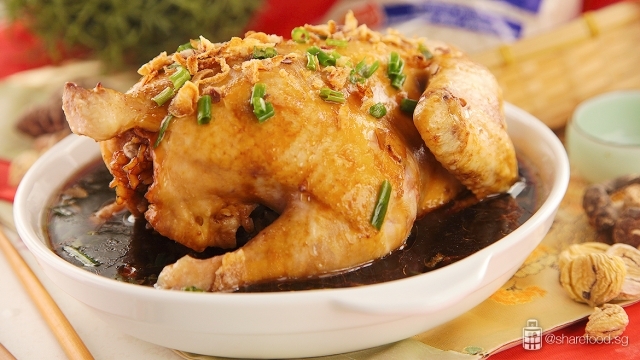 Serve this dish immediately and it's best accompanied with spicy sambal belachan.